Attention All Aquarists & Aquabotanists! The auction you all heard about, or experienced, that brought hobbyists from Seven States to standing-room only, is our GIANT SPRING TROPICAL FISH AUCTION AND FUNDRAISER! This is a LIVESTOCK auction (fish/plants/inverts). Dry goods are minimal so the focus is on the fish (yes, there are that many and it goes all day!). Sell your surplus to a captive audience, too! Open to the Public. 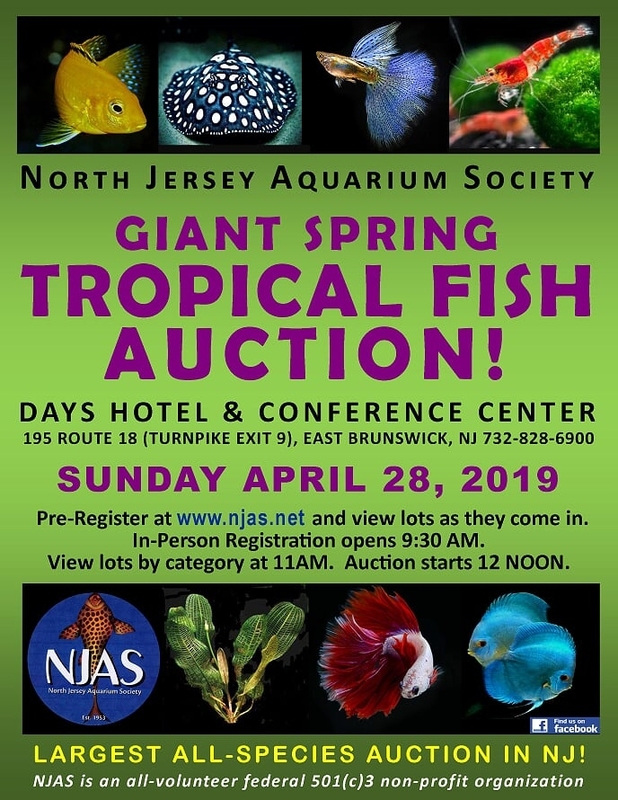 The North Jersey Aquarium Society (NJAS) will be hosting their annual Spring auction fundraiser on Sunday, April 28, at the Days Hotel in East Brunswick, NJ, right off the NJ Turnpike exit 9. Historically the largest tropical fish auction in the Garden State! Many hundreds of hard-to-find hobbyist-raised, hatchery & imported fish, invertebrates, plants...all sorts of aqua-fabulous goodies at bargain prices! Ocean to Ocean, Border to Border, it's the Best & Biggest Single-Day Non-Profit Fundraiser Auction Event Extravaganza for Fish Fans! Sellers: Here's the link for registering for the auction. Pre-registering you will get a 60-40 split. We will post pre-registered items on the website in advance of the auction. Buyers & Sellers: Send us your "wish list," and tell others what you are bringing at our Events Page. Here's the link to the auction rules. We've made some changes, so please be sure and check 'em out. Please Note...The auction will start at 12:00 noon sharp! Viewing will start at 11:00 am and close at high noon. Viewing will not be allowed after 12:00 pm. 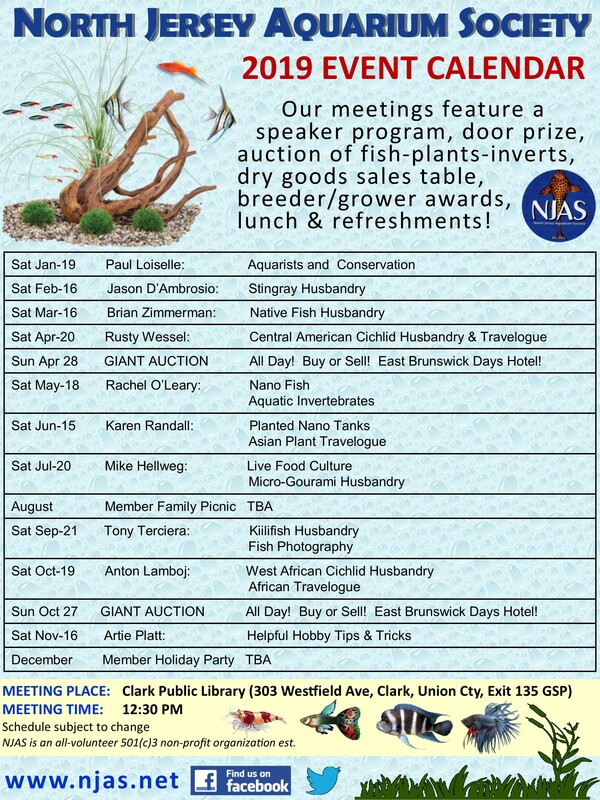 Please Join us for our Next Monthly Meeting featuring cichlid guru Rusty Wessel, "Central American Cichlid Husbandry & Travelogue"
Snacks & Refreshments will be served. Following the program and discussion there will be an auction of fish and plants, from local hobbyists and shops, many rare and hard-to-find. Doors open at high noon and feature a door prize, raffles, sales table, Breeder & Grower Award Programs, and a Plant, Fish, and Sponsor of the Month. Meet and greet hobbyists from around the region! Clark NJ. All are welcome! Schedule specifics are subject to change -- as of now we've got this exciting line up! Saturday afternoon meetings begin at 12:30 pm at the conveniently located Clark Public Library in Union County, just off the Parkway at exit 135. Many of the meetings will include a light lunch, and we'll have participation from vendor reps from time to time. We hope to see you there! Please Click Here for our Event Page on Facebook! Completed forms and questions can be emailed to NJAS Breeders Award Program. If that link doesn't work, simply e-mail pmnitz@verizon.net. 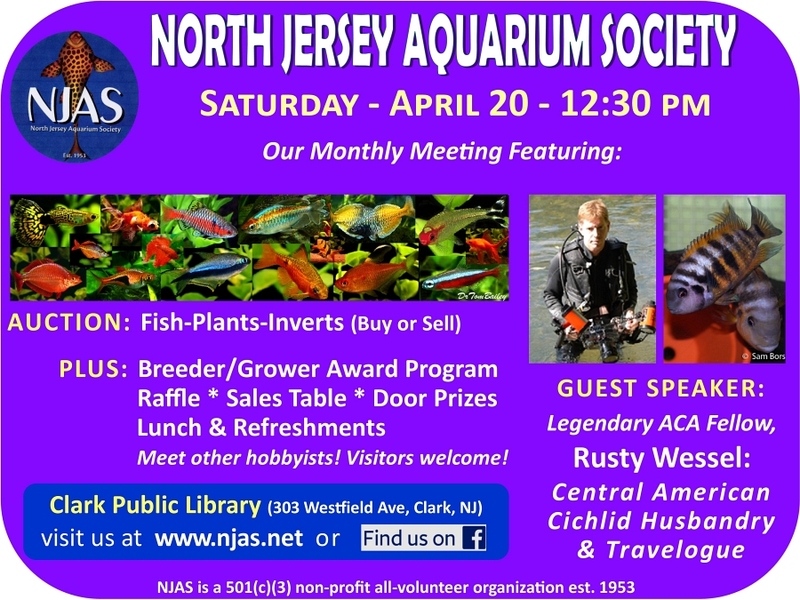 NJAS is an organization of aquarists with a wide range of interests and backgrounds. From cichlids to killies, livebearers to labyrinths...plus plants, aquascaping, breeding, do-it-yourself help...we cover a wide range of topics, and we especially encourage newcomers to join us! Our location in Lyndhurst is convenient to major highways and bus routes, and enables us to welcome a large number of attendees. We invite you to join us and look forward to meeting you.